Samsung has put up its recently announced Gear Fit 2 activity and fitness band up for preorder in the US. The Gear Fit 2 which is priced at $179.99 is available for preorder on the Samsung US website and ships in 7-10 days. 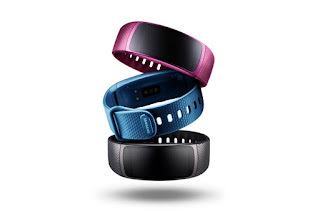 If you are interested in buying one of these Gear Fit 2 bands, do head over to the Samsung US preorder page in the Source link. The waterproof and dustproof Gear Fit 2 which runs Tizen OS sports 1.5 inch 216 x 432 pixel curved Super AMOLED touchscreen display, 512MB RAM, 4GB of storage for music, builtin GPS, WIFI, Bluetooth and is powered by Samsung's proprietary Exynos 3250 dual core processor and a 200mAh.